According to the directions of the Secretary General of Imam Ali Holy Shrine, Sayyed Nizar Hashim Habl al-Mateen, Imam Ali Center for the Care of Orphans and Needy families continues to distribute the food basket to needy families and orphans for the fourth day during the holy month of Ramadan. 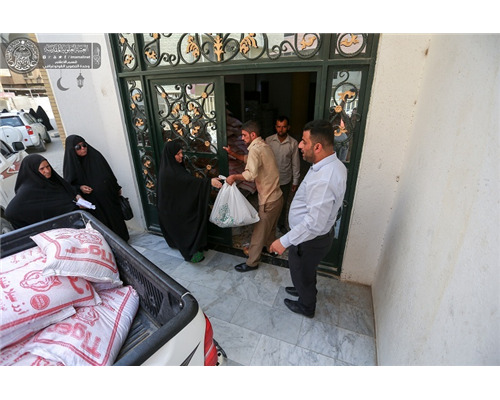 The head of the center, Mr. Karrar al-Shamaa said, "Under the guidance of the Secretary General of Imam Ali Holy Shrine, Sayyed Nizar Hashim Habl al-Mateen, the staff of Imam Ali Center had distributed food basket for the families of orphans and needy families during the holy month of Ramadan. The basket contains 13 types of food provided to the families of the needy in the province of Najaf and surrounding areas.